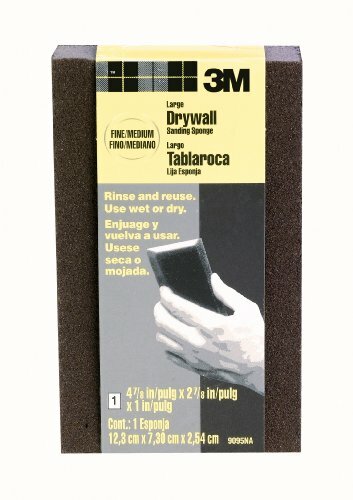 3M(TM) Drywall Sanding Sponge is ideal for sanding drywall and plaster during spot repair. Two sanding grades on one sponge in a fine/medium combination. The sponge can be rinsed and reused. WARNING: This product can expose you to chemicals which is [are] known to the State of California to cause cancer and birth defects or other reproductive harm. For more information go to www.P65Warnings.ca.gov. What is the most important for a hand tool? When you hold WaterLuu sand block, you just have comfort grab feel as its design is based on the shape of your palm. 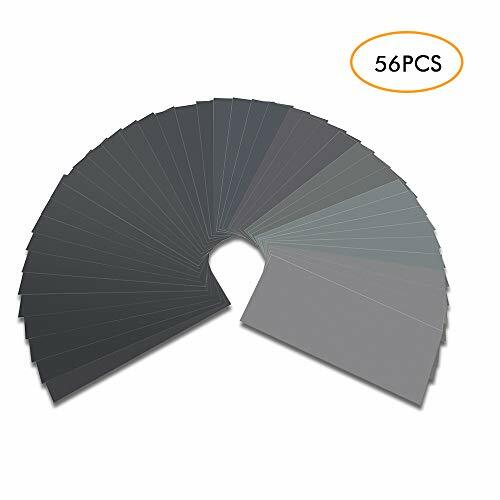 60 to 180 Grit Sandpaper: Coarse grit sandpaper is a good choice for rough sanding and removing scratch, like rust removing. 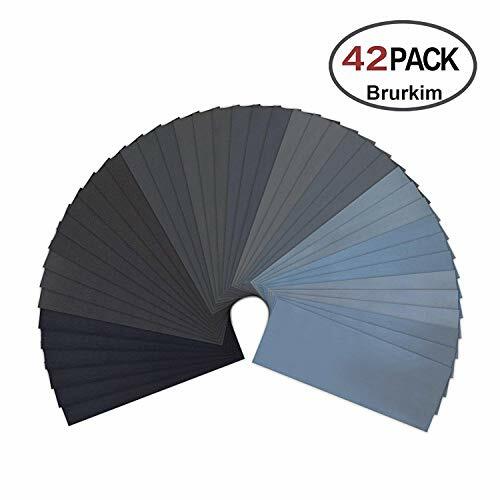 220 to 400 Grit Sandpaper: This grade grit is used for light sanding between coats of finish and to sand metal and other hard surfaces, like drywall finishing. 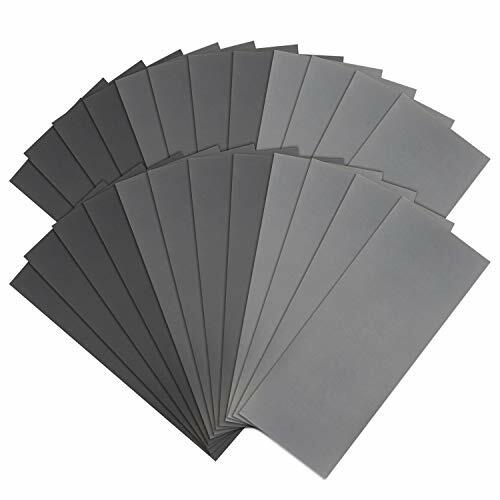 1200 to 1500 Grit Sandpaper: This grade grit is used for sanding between coats. Different Grits Assortments: Sandpaper sheets of each grit in 120g/ 150g/ 180g/ 240g/ 320g/ 400g/ 600g/ 800g/ 1000g/ 1200g/ 1500g/ 2000g/ 2500g/ 3000g, 42 packs of sheets in total. Durable&Tough: Made of waterproof silicon carbide, electro coated, seldom fall apart, tear or break up during using. Wet & Dry Sanding: No matter sand the tiles in your pool, descaling water pump or polish your autobody, they perform well. Sanding Kit: The hand sander sponge measures 6-1/2 by 3-3/8(165mm x 88mm), which fit most 9x3-5/8 sandpaper. Ergonomic Design: The hand-held part provides comfort for prolonged sanding and easy one-handed operation. 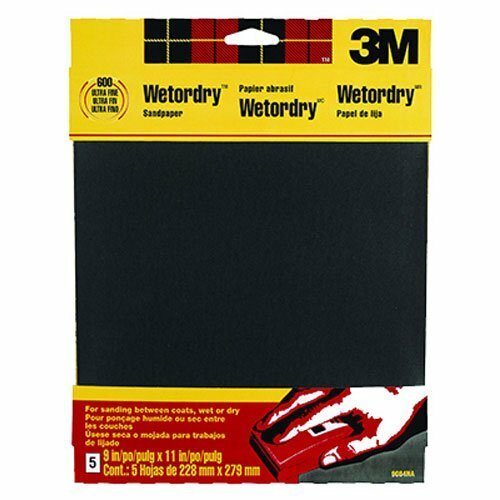 3M wetordry sandpaper cuts fast and smooth, and it can also be used to repair surface defects. It can be used with water or cutting oil. 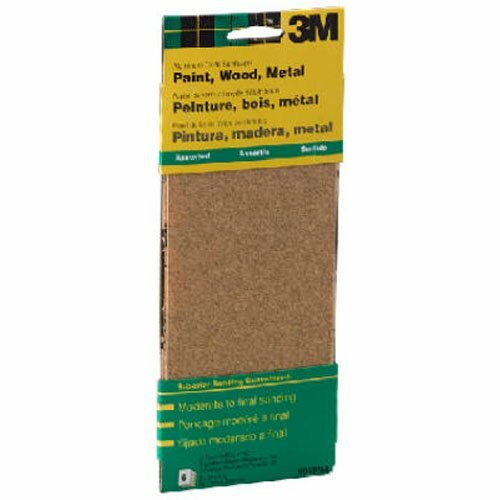 Ideal for sanding metal for repainting or prior to primer coat. For sanding between coats of varnish, lacquer, paint and other finishes. Sometimes when we are sanding smaller objects, we need, well, a smaller piece or just a strip of sandpaper. We could always cut one of our expensive 9" x 11" sheets and hopefully not cut too much off. Or you can reach for the correct grit inside the box dispenser and tear off just the right amount for your project. Each grit roll is 1" wide and is flexible enough to be used on most any shape. These abrasive strips work exceptionally well on rounded objects such as turned pens, bottle stoppers or any other smaller type of turning. They also work on most any type of material and can be cut to any length needed. 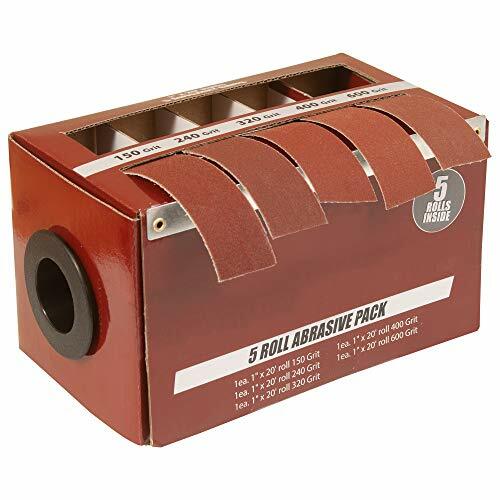 Stepping your abrasives from low grit to high grit is an essential process for finishing your pens, pencils, bottle stoppers or any wood project in the proper manner. Each roll is made from hard to find J-weight cloth backed sandpaper. Available in: 150x, 240x, 320x, 400x, & 600x. Sometimes when we are sanding smaller objects, we need, well, a smaller piece or just a strip of sandpaper. We could always cut one of our expensive 9" x 11" sheets and hopefully not cut too much off. Or you can reach for the correct grit inside the box dispenser and tear off just the right amount for your project. Each grit roll is 1 wide and is flexible enough to be used on most any shape. These abrasive strips work exceptionally well on rounded objects such as turned pens, bottle stoppers or any other smaller type of turning. They also work on most any type of material and can be cut to any length needed. Stepping your abrasives from low grit to high grit is an essential process for finishing your pens, pencils, bottle stoppers or any wood project in the proper manner. Each roll is made from hard to find J-weight cloth backed sandpaper. Available in 150x, 240x, 320x, 400x, & 600x. The center opening of each roll is approximately 1-1/2. KTI70550 Features: -Over 20,000 glass fibers in pen point. -Goes where other tools or sandpaper can't reach. -Hundreds of uses ... home, shop, auto, industry. -Made in U.S.A.. Dimensions: Overall Product Weight: -0.06 Pounds. 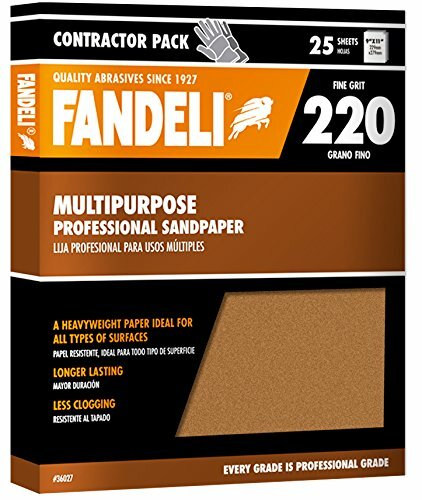 Fandeli 36027 Multipurpose 220 Grit, 9-Inch by 11-Inch Sandpaper Sheets are made of super heavy paper that works on all surfaces. Features high quality aluminum oxide mineral for longer lasting sheets, less clogging, and less waste. 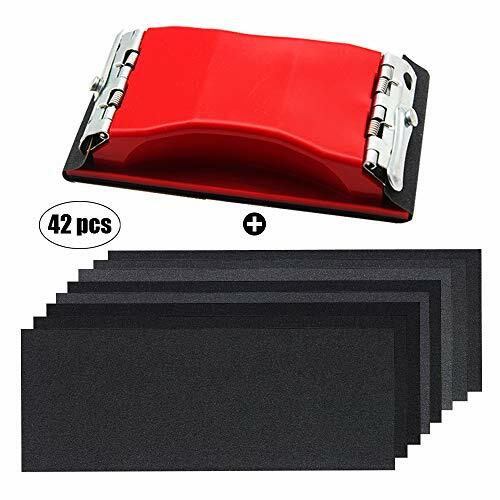 Sold as a package containing 25-sheets. Regardless of your finishing application, Fandeli can help you get the job done with its full line of quality coated abrasives from a name you can trust. Fandeli is proud of its more than 85 years of history as an integrated manufacturer of quality coated abrasives. Fandeli has invested heavily in state-of-the-art equipment and quality control systems and this allows Fandeli to maintain a high standard of quality demanded by the retail market. 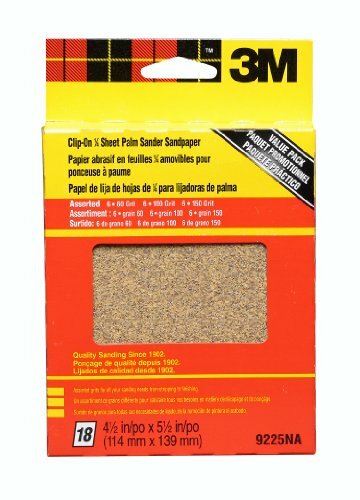 3M General Purpose Paint, Wood, Metal Aluminum Oxide Sandpaper 19015ES-CC, 3 2/3-Inch by 9-Inch, 150 Fine grit, 9-Pack, Open Stock. 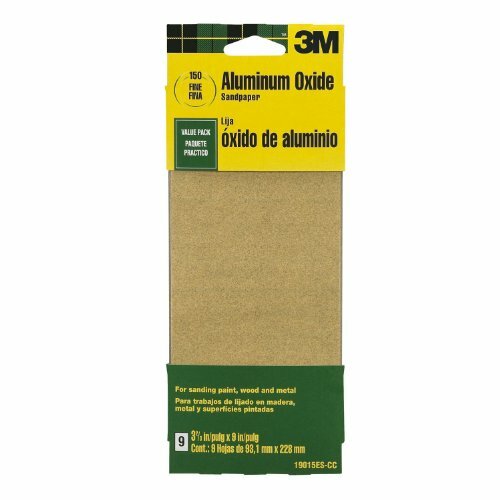 This fine grit aluminum oxide sandpaper is used for general purpose sanding on paint, wood and metal. 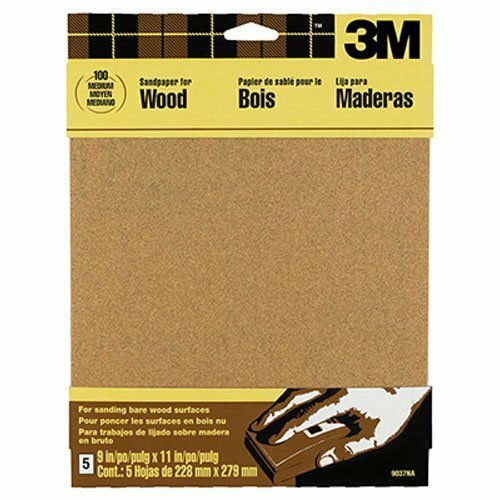 Use it by hand, on a sanding block, or cut it to size for a power tool sander. Be sure to sand with the grain of the wood and always work through a sequence of grits, from coarse to very fine. 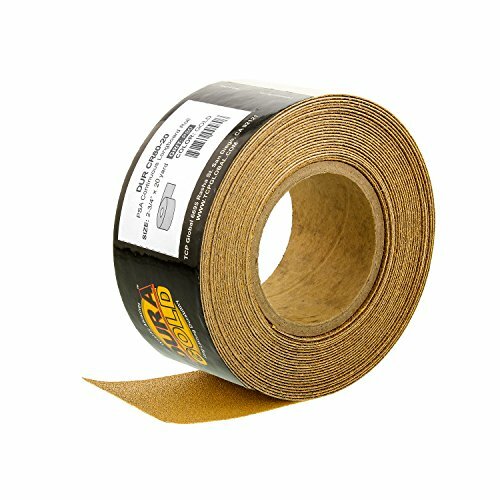 Also available in flexible sanding sponges for flat and contoured surfaces like raised panel doors, cabinets or windows. Choose a block sanding sponge or for hard to reach areas, like corners; try one of the angle sanding sponges. 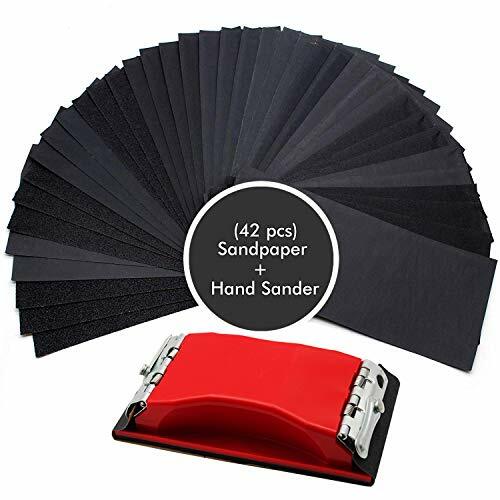 42 PCS Waterproof Wet and Dry Sand Paper for Wood Furniture Finishing, Metal Sanding and Automotive Polishing. 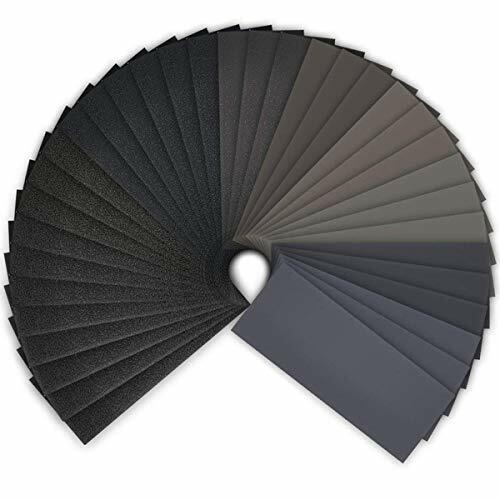 Topsma Brand Sandpaper Assortments are made of waterproof silicon carbide and are electro coated ensures the grit distributed homogeneously, good for wet and dry sanding. Contains 42 sheets wet dry sand paer in 120, 150, 180, 220, 320,400, 600, 800, 1000, 1200, 1500, 2000, 2500 and 3000 Grits. 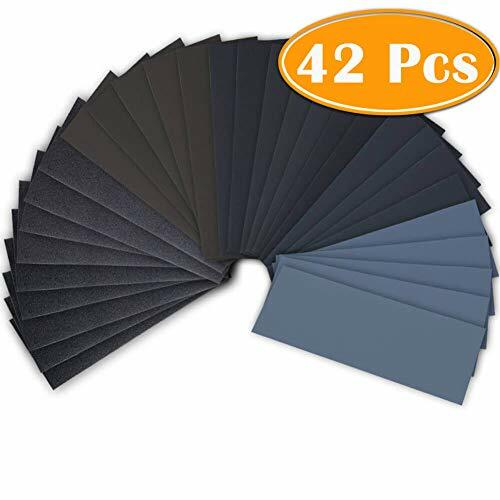 42pcs 120 to 3000 Grit Wet Dry Sandpaper Assorted for Wood Furniture Finishing, Metal Sanding, Automotive Polishing. 9 x 3.6 Inch. 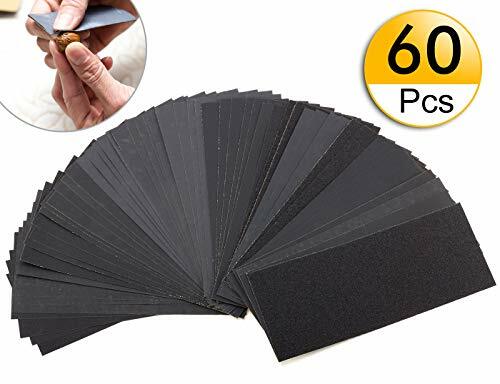 42 pieces polishing sandpaper assortment, including 14 different grits:120/150/180/240/320/400/600/800/1000/1200/1500/2000/2500/3000. Exceptional value! 3 Pieces each grit, 42pcs in total, enough for your spare or replacement. Meet your multiple usage by hand and block sanding, could be cut to most sizes as your need and want. Great for progressive projects that need to get smoother, different grits could complete almost any project from start to finish. Package Contains 14 Different Grits: 120/150/180/240/320/400/600/800/1000/1200/1500/2000/3000/5000, 4pcs Each Grit, 56pcs in total. 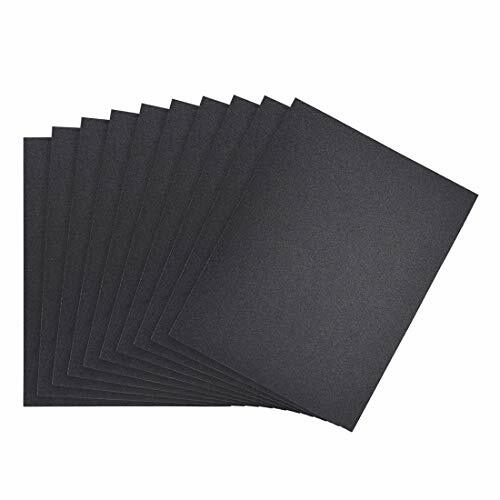 BOENFU Sandpapers are made of silicone carbide and electro coated, suit for wet and dry usage. Size of each sheet is 9.1 3.7 / 23 9.5cm. The grits will not fall apart, tear easily or crumble off during using. BOENFU Sandpaper can be used for guitar project, automotive sanding, art and craft and so on. Durable: Made of waterproof silicon carbide, electro coated, seldom fall apart, tear or break up during using. Product Size : The hand sander sponge pad size: 6.5 x 3.4 inch (165 x 88 mm), which fit the most 9x3.6 Inch sandpaper. Unique Design: The hand-held part provides comfort for prolonged sanding and easy one-handed operation. 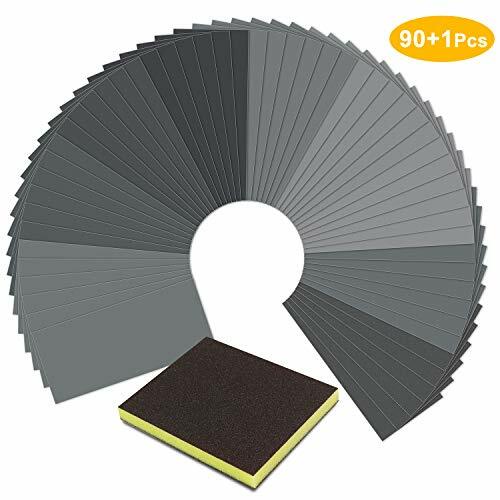 Specification : Product Name : Waterproof Sandpaper Grit : 180 Total Size : 280 x 230mm/11 x 9inch(L*W) Thickness : 0.2mm/0.01inch Material : Silicone Carbide,Paper Package Content : 10 x Waterproof Sandpaper Description : 1.Sanding paper sheets are made from waterproof silicon carbide,so it will not fall apart, tear off or crumble off whenever you use it. 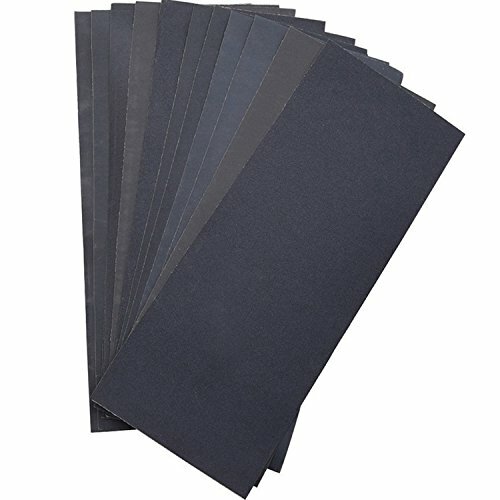 2.Waterproof and tensile resistant technology enables these abrasive paper sheets sturdy and lasts for a long time using in your projects, and they can be used for both wet and dry purposes. 3.The sand Papers are suitable for usage in art and craft, wood, automotive, metal, and plastic applications for buffing and polishing. Loading sandpaper to our hand sander HS24 make your sanding easier and faster. Paper Size: 11 x 3.5 inch, perfectly fit to hand sander HS24. 120 to 220 Grit Sandpaper: rough sanding and removing scratch. 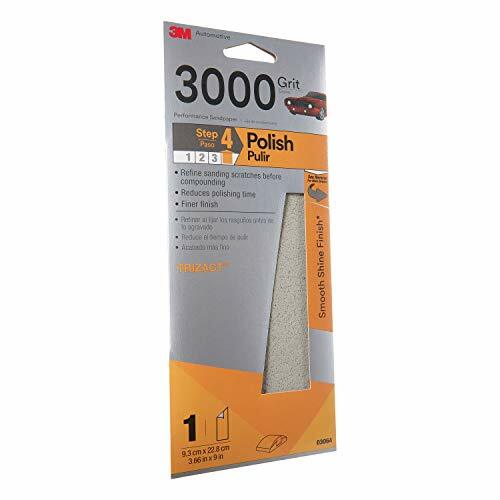 240 to 400 Grit Sandpaper: for hard stuff sanding. 400 to 800 Grit Sandpaper: final finishing before painting. 1000 to 1500 Grit Sandpaper: sanding betweent coats. 2000 to 3000 Grit Sandpaper: final buffing. Notice:The method of use shall be adjusted according to the actual polishing material. 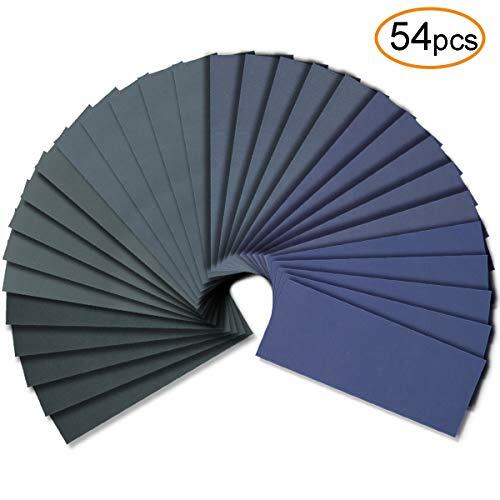 120 to 3000 Grit Snadpaper Set: including 2 sheets of each grit: 120/220/320/400/600/800/1000/1200/1500/2000/2500/3000, total 24 sheets. Made of high quality silicone carbide, evenly distributed abrasive grit. Perfect for wet and dry sanding. Widely Application: Suitable sandpaper for wood, metal, autobody, drywall, plastic and any other polishing work. 11x3.5 inch sand paper can perfectly apply to our hand sander HS24. You can also cut the sandpaper into the size you need. Easy Identify: Grit number is printed on the back of each sandpaper.